Together we continue to elevate the future of Arts and Sculpture in the Upper Valley. Join us in building on our major achievements of the past year by robustly supporting AVA’s mission in fiscal year 2017/18. Despite this transformative evolution, AVA’s core commitment to community and the three pillars of our foundation – arts advocacy, inclusive accessibility, and environmental sustainability — remain constant. 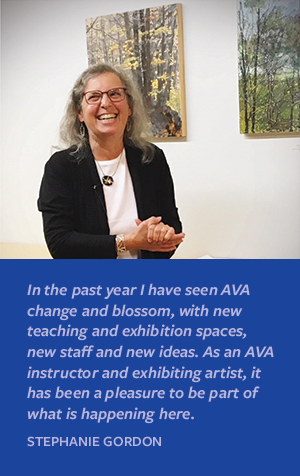 AVA continues to create deeply meaningful and much-needed opportunities for people of all ages and abilities to engage with art. AVA Gallery and Art Center — and its mission — is more important to our community now than ever. The world is changing around us. We know art often provides hope and healing, understanding and tolerance in turbulent times, yet art can also challenge us, taking us outside our comfort zone to think differently about our world. Equally important, art provides a social and economic driver to re-energize healthy, caring and sustainable communities. Now more than ever, ART MATTERS! AVA’s opportunities signal a bright and exciting future with new collaborations, new programming, new sculptural workshops and new special events being planned. Help make Lebanon and the Upper Valley an arts mecca – a cultural destination attraction. Help us celebrate the future of Arts and Sculpture in the Upper Valley. Your fully tax-deductible contribution will help AVA help our community. Please give as generously as you are able. All gifts to AVA’s Annual Fund provide essential unrestricted dollars for our operations which support all we do for our community. Make AVA part of your everyday life! Thank You from all of us at AVA!